This software bundles the American Heritage® Dictionary of the English Language and the Roget’s Thesaurus in one complete language app. It's the perfect solution to use at school, in the office, or at home! The application is regarded as one of the flagship products in Houghton Mifflin Harcourt catalog, featuring advanced search and learning tools designed by a vastly experienced developer. It combines rich Dictionary database and extensive Thesaurus vocabulary. THE AMERICAN HERITAGE® DICTIONARY OF THE ENGLISH LANGUAGE contains 10,000 new words and phrases, over 4,000 dazzling new full-color images, and authoritative, up-to-date guidance on usage. Thousands of definitions have been revised in rapidly changing fields such as astronomy and biology. Geographical entries and maps have been completely updated, and the dictionary’s signature feature notes on word history, synonymy, and language variation have all been enhanced and improved. THE AMERICAN HERITAGE® ROGET'S THESAURUS offers an intelligent and sensible guide to synonym selection. It provides a wide range of synonyms, ranging from mainstream vocabulary to the colorful alternatives that make English such a rich and versatile language. Thousands of slang, informal, and regional words broaden the coverage even further. Each synonym list focuses on a clear definition that quickly guides the user to the relevant meaning. This app is tailored to professionals, students, and academics, as well as anyone who needs a comprehensive and authoritative dictionary of current English at work or at home. Learn in style with any of the four colorful new themes – The colorful layout will turn your learning experience into an enjoyable routine. Customize your dictionary and benefit from the cheerful mood your favorite color brings you. Dive right into the intricacies of the language - With new and convenient Home page, sleeker and more intuitive visual layout, as well as innovations in the speed of searches, you can get to the desired entry faster than ever. Search autocomplete helps you find words quickly by displaying predictions as you type. Voice search helps you find an entry when you don’t know how a word is spelled. 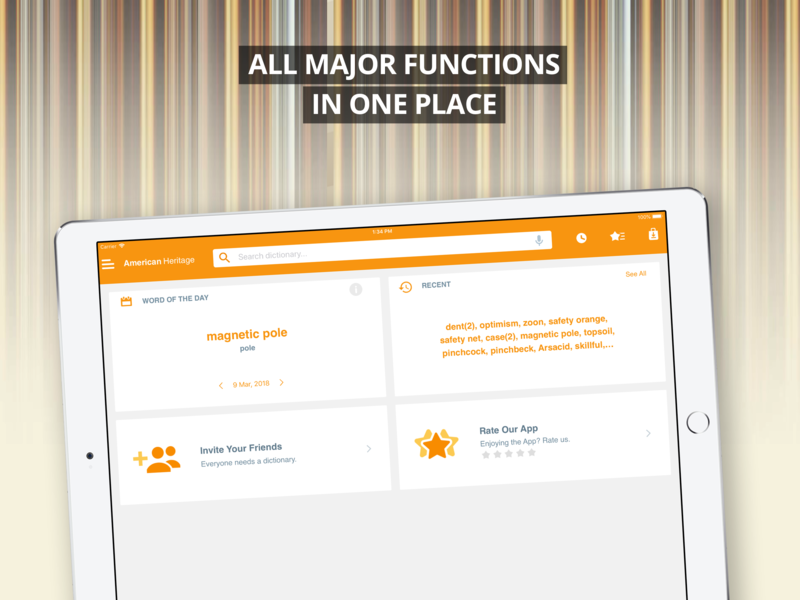 ‘Favorites’ that allow you to create custom folders with lists of words. Recent list which helps you to easily review looked-up words. Word-of-the-day option to teach you a new word every day. 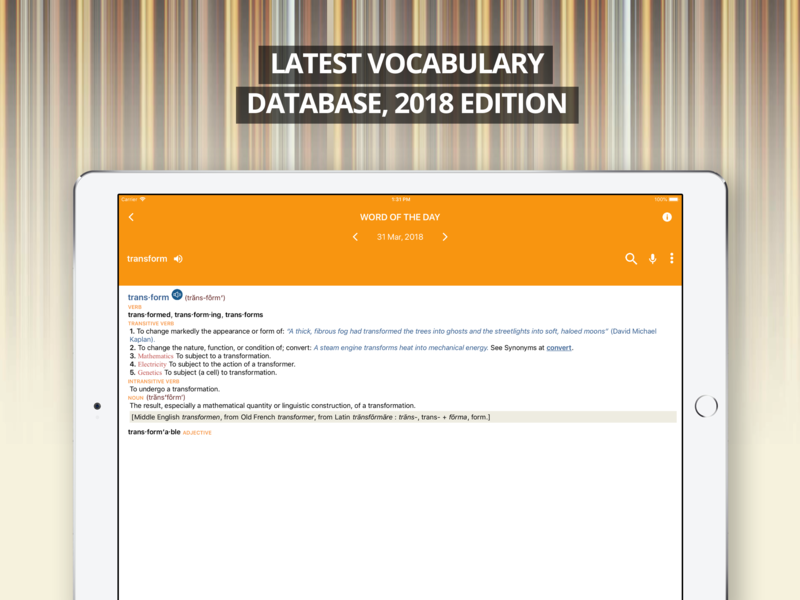 New vocabulary database (2018 edition). Delete and sort entries with Favorites/Recent list. Dictionary & Thesaurus displayed in Word-of-the-Day. NEW! Invite friends - Share the app with your friends and let them know about this great reference tool! NEW! Shortcuts for iPhone 6S, iPhone 6S+ and iPhone7 users only: invite and share with friends; review 'Word of the day' entries; search within the extensive database of the dictionary.